I don't like work... but I like what is in work -- the chance to find yourself. Your own reality -- for yourself, not for others -- which no other man can ever know. 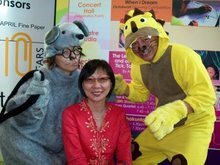 My experience of the five days volunteer work for Asian Festival of Children's Content (AFCC) 2014 was rewarding. I do not like work, yet being volunteer, I can choose to enjoy something I like in work, and that make the volunteering work an opportunities for self discovery. The rich contents in the Asian Festival of Children's Content (AFCC) 2014 is great for some one like me who enjoy children's content in general, and having the chance to see the changing landscape of the publishing world is something enlightening. Understanding DDC through INNOvative Displays!